Black Friday is always big, but this year promises to be bigger and messier than ever because of the economic crisis. October saw a record decline in sales for retailers. Several big companies barely survived, while others went under altogether. Couple that with the fact that more consumers are both conscious of their own budgets and aware that it's a buyer's market, and you have yourself a retail storm brewin'—my trick knee of values is telling me this just might be a perfect storm. In a situation like this, the number one tip is to be prepared. If you haven't done your homework already, just be thankful you have someone like Prof. Dealzmodo here who's willing to do it for you. Brick and Mortar: Before we get started, it is important to know what you are up against. According to Consumer Reports, the number of people heading out to the stores on Black Friday will be higher this year—up to 26% vs. 21% in 2007. Of that brave group, electronics will be the main draw with 85% of shoppers looking to pick up a gadget or two. That represents a 10% increase over last year. As the chart above indicates, game consoles are the biggest draw at 46%, followed by MP3 players/iPod at 44%, and flat-panel TVs at 32%. Online: Research conducted by PriceGrabber.com (download PDF) reveals that 76.3% of consumers will start their holiday shopping either before Thanksgiving (46%) or between Thanksgiving and December 15th (36.3%). As many as 95% of shoppers will look online at one point or another to purchase gifts. Items with free shipping are going to be big—44% of respondents claim that they search for free-shipping items only. Furthermore, because of the focus on cutting spending, 2 in 3 online consumers (66.3%) plan to give mostly "practical" gifts. That's a lot of numbers, but the point to take away is that competition is going to be fierce, especially for sale-priced items that are in smaller supplies than in years past. First and foremost, if money is tight, set a firm budget and stick to it. You may be surprised at how well you do. To get a sense of pricing, try using a price comparison website like PriceGrabber.com, Shopping.com Shopzilla or Yahoo Shopping. If you are wondering which is best, SmartMoney recently did a quick and dirty guide to the top comparison sites. If you're definitely buying online, you may also want to check out online coupon sites like RetailMeNot.com, MyCoupons.com and DealCatcher.com to try and score some hidden deals. If it's free shipping you're after, specialized sites like Freeshipping.org and PriceGrabber.com's Free Shipping! can help. The next step is to decide where to shop and what to shop for. The following links will help you investigate the Black Friday deals going on at your favorite gadget-centric stores. Target&apos;s Black Friday Ad Leaked! Additional deals can be found by following Gizmodo's Black Friday coverage. Naturally, complete Black Friday ads can also be found in their entirety at sites like BlackFriday.info, bfads.net, and Black-Friday.net. And remember—don't be afraid to buy refurbished. Outlet stores offer deals year round. If you are not sure what to buy in the first place, Electronic House has put together a list of the 15 best deals that this year's Black Friday has to offer. • Mike Elgan of Datamation reminds us that following BlackFriday and searching for 'Black Friday' on Twitter is a great way to get real-time information on the latest deals, inventory numbers, etc. Turning on SMS alerts can also be helpful on the big day. • 2008BlackFridayAds says to make sure to keep an eye on eBay. If you are fortunate enough to score one of the rare deals, there is always the possibility you can quickly turn it for a profit to buy even more presents. And, as always, it is a good idea to check the site to make sure you can't find better prices at auction. • Those same guys also suggest two interesting ways to beat the lines. Option #1: If your local electronics store sells appliances, consider hiding your gadget purchases inside to pick up at a later date. This could be used to secure your choices ahead of time or keep your purchases safe until you can come back to the store when the line is shorter. It may or may not work, but refrigerators are not exactly wildly popular holiday items—I doubt anyone would check inside. Option #2: Hire a broke college student to stand in line or even pull an all-nighter for you. If you negotiate for the right price, you may still save money without all the hassle. Naturally, this could backfire on you in a big way if the person you hire isn't trustworthy. • If stashing your gadgets in an appliance or hidden corner of a store isn't a possibility, a section devoted to Black Friday strategies on Bargainshare.com suggests that you investigate the old return-and-re-buy maneuver. That involves buying your chosen gadget ahead of time at full price then returning it on Black Friday to instantly rebuy at the discounted price. Obviously, this tactic would help you avoid sellouts—but many stores are cracking down on this which is one reason why it is so important to research the store return policies ahead of time. •Smartphones are where it's at. Remember that all the websites and information above can be accessed on the spot via a web-enabled smartphone. If you don't own one already, maybe it's time you got on board. 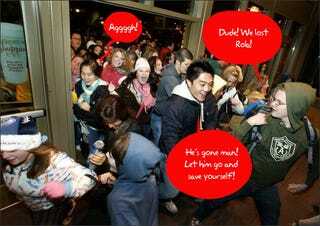 At the very least, try and find a shopping buddy that has access to one on Black Friday. As mentioned, it is important that you familiarize yourself with the return polices of the stores you visit on Black Friday—whether they are online or just down the street. It is also important that you determine whether or not the store has a price-match policy in place. Naturally, this information along with knowing which stores in your area are offering the hot gadgets greatly increases your chances of nabbing the best deal. However, many stores suspend their price-match policy on Black Friday: Best Buy and Circuit City both have price matching policies, but they do not apply on Black Friday. On the other hand, Walmart's Ad Match program will be active on the 28th provided that you have an ad for an identical product from a local store with a price that is currently in effect. Black Friday didn't get it's name for being a walk in the park. Deception, delusion and crazy crowds are all part of the deal, in addition to the actual deals. • As you probably already know, Black Friday is primetime for the dreaded bait-and-switch. If you are re-directed by salespeople to substitute products or advertised prices somehow change at the register because of a "necessary" add-on, you are probably being scammed. In this situation, your best defense is a good offense. Speak up and demand to talk with a supervisor. The last thing these people need on a nerve-wracking Black Friday is someone being difficult. Chances are they will give in to your request to make the situation go away. As a retail sales veteran I can recall countless instances where my judgment was overruled by a supervisor looking to avoid a fight. • Mail-in rebates can save you money, but you have to take an honest look at the situation and ask yourself, "Will I really fill this rebate out and send it off in the time alotted?" Several studies conducted over the years have concluded that a surprising number of individuals never claim their rebates. If you decide to purchase an item with a rebate offer it is imperative that you fill out the form immediately and send it off. Also, keep in mind that many companies use these rebates as a way of making it more difficult to return items. It is also a great way for the company to collect consumer information. Besides, as the recent bankruptcy of RebateStatus.com proves, in this economy, there is no guarantee you will get the rebate even if you fill out all of the necessary paperwork. •Don't expect things to go smoothly—bad things can and will happen. Whenever you have a large group of excited people, with a generous number of aggressive a-holes mixed in, tensions are bound to boil over. Because of this, Consumerist publised a list of 28 bad things that will happen on Black Friday which covers at least a portion of the potential pitfalls. Read it. Finally, if you miss out on the deal that you really wanted, don't sweat it. Winning individual battles on Black Friday is not as important as winning the war. Just make sure you stick to your budget and hopefully you will have better luck with the next item on the list. It is also important to note that the prices on popular items like HDTVs and Blu-ray players are rapidly coming down anyway, so there's a good chance you'll be able to realize much of the savings throughout the holiday shopping season. If you are in the market for an elusive Nintendo Wii, GameStop claims that they will have enough to last through the first week of December. If that's true, it's in your best interests to scoop one up right away. After all, the Wii is one thing you are not likely to score a Black Friday discount on in the first place. Prof. Dealzmodo is a new regular section dedicated to helping budget-minded consumers learn how to shop smarter and get the best deals on their favorite gadgets. If you have any topics you would like to see covered, send your idea to tips@gizmodo.com, with "Professor Dealzmodo" in the subject line.